The problem of recording Vocals for the smaller studio has been a constant source of difficulty over the years. If you stop and think about it, the Human voice is the most emotive ‘instrument’ we have. From being born, we are used to the sound of a singing voice, and consequently, most of us are experts on the subject without even knowing. Consequently, if a vocal is ‘muddy’ or ‘boxy’, the average person on the street could tell you it doesn’t sound ‘right’, much more authoritatively than they could say a badly recorded guitar or bass. It needs to be quiet. I mean REALLY quiet. It may be that most of your time, the music you make will require a big, shouty vocal, but what about the day when you need to record that quiet, softly whispered love song, and all you can hear is the whirr of your hard drives in the background. I’ve seen people design studios on paper, and happily state, “ the vocal mic can go over there”, purely because it looks nice on paper, without giving any thought as to how near a wall the mic may be, or what surfaces will be behind the singer etc. 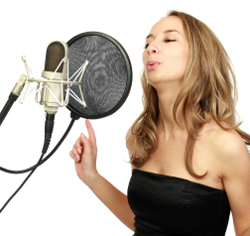 Best practice says that you should place your vocal mic at least 3 feet away from any reflective surfaces i.e. walls, and there should be a non reflective surface behind the singer. Then make a ‘clean’ recording i.e. no effects at the input or output stage. This recording will be the most important aspect of all the vocal recording you ever do, because if you can get a good clean initial recording at this stage, everything else is a bonus, but if it sounds wrong here, it will always be a case of trying to compromise using effects and eq’s and frankly, there ain’t enough time in anybodys world for that! There are many microphones in the market place for you to choose from, and many of them are very good value and quality indeed, however, here at Scan, we have conducted our own trials to assess which microphones will work best in which situation. These aren’t the only options, but in our opinion they are the best! Many people understand that if you record an acoustic guitar, and want to change the sound a little, without using EQ’s or processing, you can alter the position of the mic, either a little further up the neck or away from the soundhole another couple of inches, but the same is true of a vocalist. In fact the best session singers are not necessarily the ones with the finest voice, but the ones who know how to control it best. A great singer will ‘work’ the mic, leaning in closer for quiet breathy qualities and pulling back and slightly offset for lungbusting high notes or shouts. Watching a great singer is hugely enjoyable for engineers and producers, because the biggest pain is trying to record a vocalist with no mic technique at all. Just seen your message about our RSS feed not working on the Scan audio blog. We’re still working on the site itself and it’s very much in Beta until the end of August, so bits and peices may come and go functionality wise until that point. I’ve just given it a try now and appears to be working at our end so if you would like to retry it hopefully it’ll work for you as well. If not drop me a quick mail to peteg@scan.co.uk letting us know what browser or feed reader your using currently and I’ll see what i can get our webguys to do in order to sort it out.